(CNN) -- Susan Atkins, a terminally ill former Charles Manson follower convicted in the murder of actress Sharon Tate, on Tuesday was denied a compassionate release from prison. 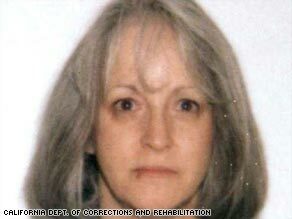 Susan Atkins, Califorina's longest-serving female inmate, is shown in her most recent mug shot. Atkins, 60, has been diagnosed with brain cancer and has had a leg amputated, her attorney said. In June, she requested the release, available to terminally ill inmates with less than six months to live. The California Board of Parole Hearings' decision -- posted Tuesday on its Web site -- came after a public hearing on Atkins' request. It means the request will not be forwarded to the Los Angeles Superior Court that sentenced Atkins. The court would have had the final say on Atkins' release. Her attorney, Eric P. Lampel, called the parole board's decision "unfortunate." "[The board] ignored the vast majority of evidence presented," Lampel said. "There was a huge amount of pro-compassionate release testimony from many witnesses. It apparently fell on deaf ears." Known within the Manson Family as Sadie Mae Glutz, Atkins and four others were convicted in connection with the deaths of five people, including Tate, in August 1969. According to historical accounts of the murder, Atkins stabbed Tate, who was eight months pregnant, and scrawled the word "pig" in blood on the door of the home the actress shared with director Roman Polanski. By her own admission, Atkins held Tate down and rejected her pleas for mercy, stabbing the pregnant woman 16 times. Atkins' request roused long-dormant memories of the two-day killing spree that terrorized Los Angeles and left seven people dead. It polarized those who were involved in the case -- and even those who weren't -- over whether she should die behind bars. Atkins told a 1993 parole board that Tate pleaded for her unborn child's life as she held her down. "She asked me to let her baby live," Atkins said. "... I told her I didn't have any mercy on her." Three of Tate's houseguests were also slain by the killers, as was a teenager visiting the home's caretaker in his cottage out back. Atkins was also convicted in the earlier murder of music teacher Gary Hinman. One of the first people Atkins confessed to was Virginia Graham, who shared a cell with her before investigators determined the Manson Family was responsible for the murders. Graham said last month she believed Atkins should die in prison. "She showed that poor woman absolutely no mercy, none," Graham said. "So why should anybody show her mercy at this time?" Sharon Tate's sister, Debra, has staunchly opposed Atkins' release. "She will be set free when judged by God," Debra Tate has said. "It's important that she die in incarceration." Los Angeles County District Attorney Steve Cooley said Monday he was strongly opposed to the release, saying in a letter to the board it would be "an affront to people of this state, the California criminal justice system and the next of kin of many murder victims." Cooley noted in his letter that Atkins was initially sentenced to death, like others in the Manson Family, including its leader, Charles Manson. Their sentences were commuted to life in prison in 1972, when the U.S. Supreme Court struck down the death penalty laws as they were written at the time. California Gov. Arnold Schwarzenegger said Tuesday he was also opposed to releasing Atkins. "I don't believe in [compassionate release]," the governor told reporters. "I think that they have to stay in, they have to serve their time." Even if Atkins is dying, Schwarzenegger said, "Those kinds of crimes are just so unbelievable that I'm not for the compassionate release." Earlier, Suzan Hubbard, director of adult prisons in California, also recommended against granting Atkins' request. Vincent Bugliosi, who prosecuted Atkins and other members of the Manson Family, said he supported her release, if only to save the state money. Through Monday, the cost for Atkins' medical care since she was hospitalized March 18 totaled more than $1.15 million, and the costs for guarding her hospital room are more than $308,000, said California Department of Corrections and Rehabilitation spokeswoman Terry Thornton. Terminally ill inmates rarely are allowed compassionate release, records show. In 2007, 60 such requests were made to the department, Thornton has said. Ten were approved. Atkins, who has been incarcerated since 1971, is California's longest-serving female inmate. According to a Web site maintained by her husband and attorney, James Whitehouse, she is now a born-again Christian. During her incarceration, the site says, Atkins worked to help at-risk youth, violent crime victims and homeless children, among others. The Web site does not mention Atkins' illness. Lampel said last month Atkins is paralyzed on one side. "She can talk a little bit," Lampel said. "She can't sit up in bed without assistance, and obviously she can't walk around because she's an amputee." Atkins has expressed remorse for her crimes. "I know the pain I caused Mrs. Tate," she said at a parole board hearing in 1985.
ln May, authorities dug for buried bodies at the Inyo County, California, ranch where Manson and his followers once lived, after police became aware that testing had indicated human remains might be buried there. Nothing was found, authorities said.